Give praise to posole, the regional, endlessly customizable Mexican stew. Let's hear it for posole, the choose-your-own-adventure of Mexican cuisine. Start with a stew speckled with chewy bits of hominy and seasoned with lime and braised pork. Depending on the region, that soup could be green from jalapeños and tomatillos (if you’re in Guerrero) or red from guajillo or ancho chiles (in areas such as Mexico City and Jalisco). Then, choose from a selection of toppings: finely chopped onions, sliced avocado, lime, radishes, lettuce, queso fresco. Go big, or keep it simple. That’s the true beauty of posole: No two bowls look or taste exactly alike. I had posole for the first time as a high schooler living abroad in Cuernavaca. Most weekends, my friends and I would go to bars with my host mother, and she would get us drunk on cheap tequila. On one particular hungover morning, she loaded me into the back of her Jeep, took me to a restaurant in the mall, and ordered me my first bowl of posole. The space was drab and cramped, and there wasn’t even a menu, but that posole brought me back to life. It was nourishing like a cup of broth on a sick day—bright with lime, rich from the chiles and pork. It was soup, plain and simple. And in that moment it was everything I wanted. Before posole was my hangover cure, it was a ceremonial dish for ancient Aztecs—corn was considered a sacred crop. Pork was added later when the Spaniards arrived in the 16th century and brought over pigs. These days, the stew is found all across Mexico, typically made by families on weekends or special occasions because there’s a lot of labor involved—from cooking the pork to making the chile sauce to the nixtamalization of the corn (soaking it in pickling lime so the kernel softens and sheds its skin). 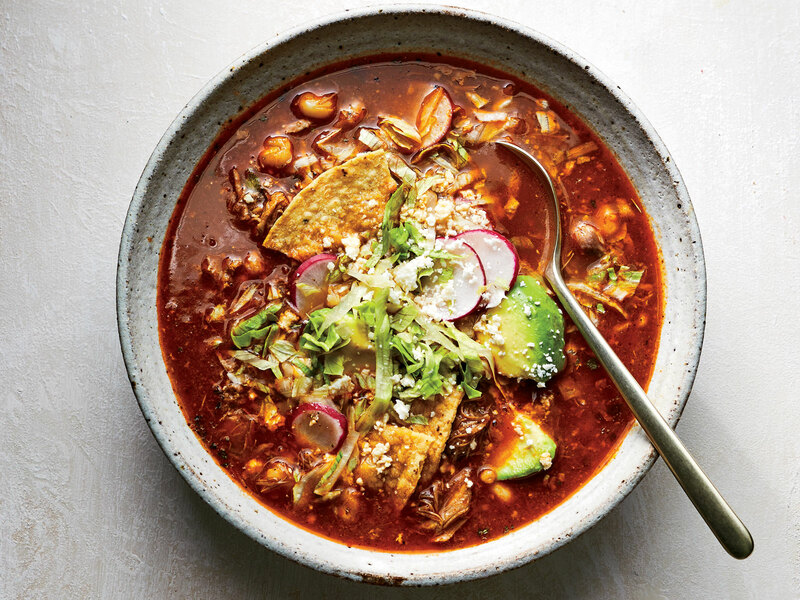 Here in the U.S., the endlessly customizable nature of posole has made it a favorite canvas for Mexican-American chefs to creatively blend their family recipes with less traditional techniques and ingredients. The L.A. chef Ted Montoya makes a version of posole at his pop-up food stall, Caló Provisions, with a chicharrón-infused dashi broth and add-ons such as a poached egg, roasted tofu, and confited chicken thighs. At the seafood-centric Caracol in Houston, James Beard Award–winning chef Hugo Ortega adds littleneck clams to his aromatic posole verde. And for the signature posole at El Jardín in San Diego, chef Claudette Zepeda-Wilkins—whose aunt owned a posole restaurant in Guadalajara in the ’70s—combines her family’s smoky guajillo chile sauce with a briny dashi-kombu broth, carnitas cooked in Mexican Coca-Cola for depth and sweetness, and Meyer lemon gel for a tangy finish. But my favorite version is the one ladled out at La Casa de Toño—Mexico City’s cultishly beloved, family-run, 44-location posolería, which offers a no-frills, diner-like experience. The restaurant started in 1983 as a small street stand serving quesadillas and stews but quickly drew crowds thanks to its traditional, scratch-made posoles. At La Casa de Toño, you will find people from all walks of life—tourists, big families, young couples, and yes, hungover teens—having their own private posole moments: adding a crumble of cheese, mixing in some chopped onions or tortilla chips, arranging sliced avocado over the top. The posole at La Casa de Toño is beautiful in its layers of flavor: the smokiness of the thick red chile broth; the aromatic, sweet taste of the corn; the intensely spiced bits of pork. But even more than any single element of the dish, what I love is how the restaurant experience is wonderfully democratic and unfussy in every way. Each small bowl costs 50 pesos, or around $2.50. The service is quick and efficient, the paper menus double as placemats, and the white walls have little in the way of decoration. But you can’t help but feel that this is the whole point—to take away the distractions so all that’s left to enjoy is the profound comfort in your own little bowl. Bertha González Nieves, cofounder of Jalisco tequila house Casa Dragones, has fond memories of growing up near Enrique in Mexico City. “The best thing to try there is the posole blanco with a side of barbacoa,” she says.